This beautiful flower comes from the Mimosa tree that is native to China. 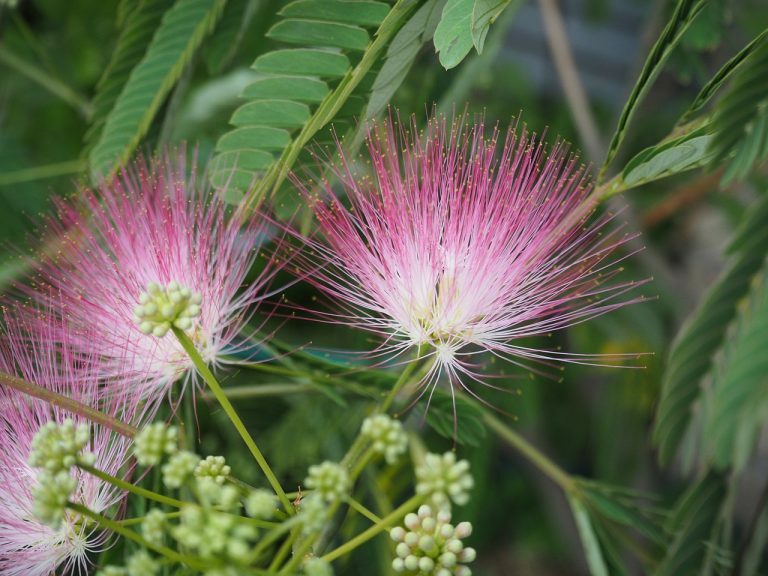 Also known as Persian Silk Tree, the Mimosa grows up to 50 feet tall and produces fern like leaves and 7 inch seed pods that are toxic. This tree needs to be fully mature before it blooms with its beautiful flowers that can be red, pink, or white in color. The flowers are round but very thin and thread like, hence the name Silk tree. Non-native to the United States, this tree can be found growing in southern areas such as the Gulf Coast and Florida where the climate tends to be warm and sunny. In Chinese Medicine, we use the flower and the bark of this tree medicinally to treat people that suffer from emotional imbalance. The properties of this herb are sweet and neutral and enter the Heart and Liver meridians. It is known to invigorate the blood to improve circulation and helps to alleviate Liver Qi stagnation. Depression is one of the emotional imbalances that it treats, often referred to as Liver Qi stagnation in Chinese Medicine. He Huan Hua and He Huan Pi also have the action of calming the spirit or what is referred to as the shen in Chinese Medicine. Because it calms the shen, it is used for insomnia. The bark of the Mimosa tree has another curative property, helping to alleviate pain and swelling in the body due to chronic pain and trauma. The mature flower or bark from this tree is considered to be very safe, with a daily dose of 9-15 grams of a good quality, mature, aromatic dried flower. Other forms come in tincture, powder or granules, and all can be found with your Chinese Herbal Medicine practitioner.